CHINA - Looking at the size of the breakdown of the inventory for August, 2015, the adjusted information from MOA is indicating 387.50 million on-farm pigs and a 38.63 million sow herd (as compared to July at 385.57 million on-farm pigs and a 38.78 million sow herd), writes Ron Lane, Business Director Asia Pacific. The August 2015 387.50 million on-farm inventory is up 0.5 per cent from last month (July 2015). This is the second consecutive small monthly increase in several months. However, the total drop in on-farm pigs as compared to August 2014 is 10.4 per cent . Looking at the August 2015 sow herd, it was down 0.4 per cent from July and was down 14.2 per cent from one year ago. In August, a further 155,000 sows disappeared. Recent results for September show similar trends. Looking at the size of the breakdown of the inventory for September 2015, the adjusted information from MOA is indicating 389.83 million on-farm pigs and a 38.55 million sow herd. The September 2015 389.83 million on-farm inventory is up 0.6 per cent from last month (August 2015). This is the third consecutive small monthly increase after several declining months. However, the total drop in on-farm pigs as compared to September 2014 is 11.8 per cent . Looking at the September 2015 sow herd, it was down 0.2 per cent from August and was down 15.4 per cent from one year ago. In September, a further 77,000 sows disappeared. During the first 9 months of 2015, a total of 4.45 million sows have been culled and/or eliminated from the total national herd. Since February 2013 (the past 32 months), the China sow herd has seen more than 12.39 million sows eliminated. The rate in the number of sows slaughtered is slowing down, but it has not stopped! Market pig prices in China had fallen continuously from early August 2014, but have risen during this past spring and summer (since the low weekly price for this year on March 16th of 12.09 RMB/kg ($ 1.91 USD/kg-$ 0.86 USD/lb.). To date, the higher prices were during the first 3 weeks of September-the highest being 18.07 RMB/kg ($ 2.85USD/kg-$ 1.29USD/lb.) during the week of September 8th. 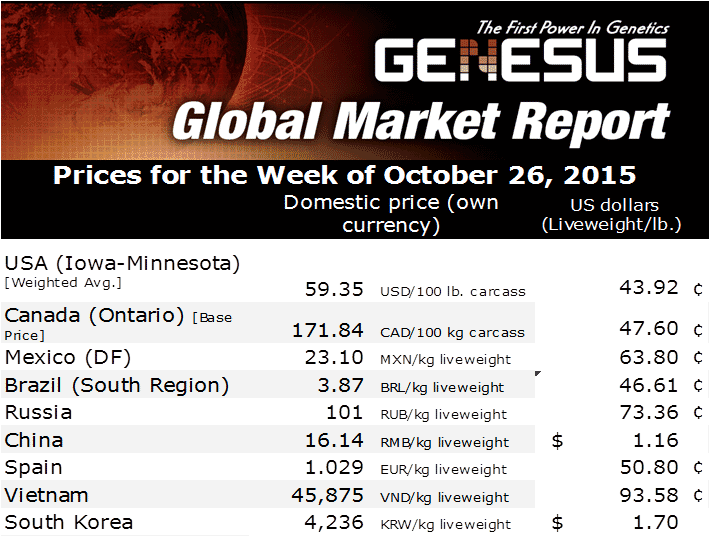 Recently, (October 27th) the market pig price decreased to 16.65 RMB/kg-$ 2.62 USD/kg-$ 1.19 USD/lb.) from the previous week of 17.30 RMB/kg ($ 2.73 USD/kg-$ 1.24 USD/lb.). This is a large weekly drop; however, the current price is giving producers about 425.5 RMB/ market pig ($ 67.08USD/pig) profit margin depending on the scale of the operation. There is a substantial increase in the pig to grain ratio. As of last week, the ratio had reached 8.23: 1; mainly due to the decrease in corn prices, (6:00:1 is considered the benchmark for breakeven prices). Pork prices had been rising for most of the summer, but since the end of September, the prices have fallen each week. Average corn prices have been lower for the past few weeks with corn at 2,114 RMB per tonne ($ 333.20 USD/tonne) for October 6th as compared to 2,307 RMB per tonne ($ 363.71 USD/tonne) on September 1st, 2015. The national soybean meal price was 2,905 RMB/tonne ($ 457.99 USD/tonne) for October 1st, 2015 and at 3,015 RMB/tonne ($ 475.33 USD/tonne) for September 1st, 2015. China has recently signed agreements to buy a record 13.18 million tonnes of soybeans worth around 5.3 billion USD from the USA. China will import a record 79 million tonnes of soybeans from various sources around the world in the past crop year (China’s soybean imports rose 13 per cent in the first 9 months of 2015 (a total of 52.8 million tonnes). A major reason for the increasing number of imports is the strong difference between domestic price ( on October 21st domestic price was about 4,000 RMB/tonne ($ 630.61 USD/tonne) versus the import prices which were about 840 RMB/tonne ( $ 132.43 USD/tonne) cheaper. Current grain reserve is approximately 230 million tonnes-the largest in the world. The yield for 2015 summer grains in China reached a record high. This is the 11th consecutive year for the increase. The National Bureau of Statistics reported that the country’s summer grain output (mainly wheat and early rice) reached 141.07 million tonnes—this is up 3.3 per cent from 2014. Summer grains account for about 25 per cent of the annual total output. Although for several years there have been increases in grain output, some major problems still exist. The primary problem is inadequate grain storage capacity. About 35 million tonnes of grain are lost or wasted in China each year either during storage, transportation and processing. This year’s bumper crop along with the high import of cheaper cereals (for the first 6 months of 2015, imports jumped 60 per cent over this time last year to 16.29 million tonnes) has taxed the limited grain storage facilities. I like the a statement from the China Meat Association (CMA) responding to the October 26th, World Health Organization’s IARC released report concerning fresh beef and mutton and other red meat as "more likely carcinogen (including consuming sausage, ham, bacon and other processed meat products). In this regard, CMA, who responded that this report is not careful, unscientific, and conclusions of the report does not fully represent the views of the global scientific community, the meat product is carcinogenic need a more comprehensive and objective risk assessment to reach a conclusion”. China imported about 443,600 tonnes of pork during the first 8 months of 2015 (an increase of 15.85 per cent compared to last year). August imports were 64,400 tonnes (an increase of 55.10 per cent from last year). At a recent Meat Product Industry Expo held in Qingdao, China, one of the speakers from the industry (Du Junfu) indicated that over the next 5 to 10 years, there could be a substantial increase in the demand for meat products in China and that 50 per cent of the global pork demand will come from China. In the past 5 years, the average meat product per capita increased by 4.59 kg/person (10.1 lbs./ person). Since the domestic pig prices are high, the large spread compared to imported pork will likely cause pork imports to reach about a 20 per cent increase for 2015.